Infinite Art Tournament: Element of the Month: Silver! Doubtless, many of you are as outraged as I am that, once again, the online rag Slate has totally plagiarized one of my best ideas. First it was the whole blogging the Bible thing -- though, admittedly, in that case they had started their series before I actually came up with the idea myself. But still. And now, what are they doing but blogging the elemental table! But I must point out that, where here at the L&TM5K the Element of the Month is a feature dedicated to the expansion and improvement of human knowledge, our competitor Slate is by its own admission blogging the elements for that grossest, that most crass of all human purposes: to promote a book. Silver is one of those elements that get a lot of attention from people who aren't otherwise especially interested in chemistry. It is in "Group 11," a column of the periodic table consisting of metals that are rare, malleable, durable, and -- perhaps not insignificantly -- shiny. These are the elemental metals that have traditionally been used in many cultures as currency -- not just Silver, but also Copper (Element #29), Gold (Element #79), and Roentgenium (Element #111)! ...well, OK, maybe not Roentgenium, of which only a couple dozen atoms have ever been synthesized, and none of those stable enough to remain in existence for more than a few seconds. But in theory, it would make great coinage! Silver also has a gazillion other uses. Obviously it's big in jewelry and decorative metalwork. You may also know that silver nitrate and other silver-based compounds are the light-sensitive chemicals that make traditional photography work. Indeed, a dozen years ago, photography consumed about a third of the world's silver production, more than ten times the amount going into coinage. Since traditional photography has been somewhat affected by the popularity of digital images, though, that number has shrunk down to something more like 1/10th. Here's something I didn't know: Silver is highly conductive to electricity. It's even better than copper, in fact! So why don't we use it to move power through our houses? Well, because it's more expensive, duh, and copper does pretty well at getting the job done. It is sometimes used in high-end electronic components, though, where its superior conductivity might actually make a difference and where you don't run the risk of departing renters cutting open the walls to sell the wiring for scrap. Geez, what else. It's used in long-life batteries. It is apparently somewhat antibacterial, antifungal, and even antiviral, and was widely used in bandages and unguents before the discovery of antibiotics and still sometimes today. It's used in dentistry, of course. And so on. 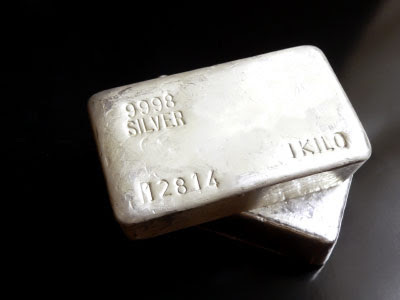 Silver is currently costing about $18 per ounce. That's more than twice what it sold for four years ago. Like gold, it's a metal that people like to buy up when they think the world is ending and that paper money is becoming worthless, worthless, and that the enduring value of precious metals will allow people who hold them to have their pick of whatever food, fuel, cigarettes, ammo, and women are still in circulation in the smoking rubble of our once-proud civilization. So, if you need to buy Silver in bulk, you might want to see if you can hold off a few years until the economy picks up again and the price goes back down. I like how you suggest that radioactive material would make good coins. Silver was widely used in bandages? I think you're going to have to add dead-man's bandages to the list of things you like to acquire at estate sales, though admittedly you might get some weird looks if you ask around for them. And I think the bandages were, like, infused with silver salts or something. It has been a few days since my "research." Silver is still widely used in bandages. Silver has excellent anti-bacterial properties, so most of the bandages for high-infection-risk wounds contain some proportion. It makes them very expensive, but since they last a lot longer than regular bandages, the cost is generally worth it. Hmm. What about silver plumbing? If I can have copper plumbing, why not silver? And — silver cookware? I don't know why that comment posted twice. Anyway, I thought you might like to know that I analyzed the first two paragraphs of this post (not counting the intro) using the website iwl.me (I Write Like) and it turns out that you write like George Orwell. It told me that I write like Dan Brown, which makes me want to die.